If you don't already own a BlackBerry, you will not want this phone. And if you do, you still might not want it, even if it may very well be the "best BlackBerry ever." The most exceedingly common observation about the Torch is that it's very much still a BlackBerry. Despite the gloss-speckled new BlackBerry 6 software, despite the retro-quirky slider anatomy, it's a BlackBerry. Well, what is a BlackBerry? BlackBerry, in the beginning, was a glorified two-way pager. It's slowly evolved from that decade-old core into what it is today. Like Microsoft Office, a lot of people might use it at home, but it's mostly designed for its corporate base. What BlackBerry tends to be good at, and what BlackBerry users love about them clearly exposes those corporate-tinged roots: well-designed hardware keyboards, push email (routed through RIM's servers), BlackBerry Messenger (a robust, addictive BlackBerry-to-BlackBerry instant messaging service), communications security and encryption (see: Obama, Saudi Arabia, UAE). What it's not been good at: basically everything else. I mean, if you want to highlight the philosophical difference between RIM and say, Apple, consider that RIM CEO Mike Lazaridis brags about how carriers love BlackBerrys because they conserve bandwidth, while Apple told AT&T to screw itself when the carrier suggested making the YouTube app less awesome for users by eating less data. When you see that for the first time since 2007 BlackBerry is not the top-selling smartphone platform in the US, RIM's looming problem seems a lot loomier. The Torch and BlackBerry 6 are RIM's effort to avoid the same kind of fate Windows Mobile suffered by ignoring regular people and leaning too much on corporate IT departments to keep them in business, especially when Apple and Google are making inroads into the workplace. That's a lot of context to swallow, but understanding the DNA and RIM's incipient existential angst is the only way to understand the Torch: It's like Two Face, but even less focused. Is BlackBerry 6 a touchscreen OS? A trackpad and keyboard OS? Mostly for business users? Regular people? It's not quite sure, and the results can be pretty messy. The psychological split is real, and its imprint dominates nearly every aspect of the phone. FWIW, I'm looking at the phone purely from the role of a consumer—if your boss or IT department is handing you the phone, it's not like you've got a choice anyway. Just thank them for giving you this one. Not to rely too much on the trope that the Torch is "like a BlackBerry," but the overarching industrial design and build really is just like everything else RIM has produced over the last year, simply evolved into a chromier slider form factor. While it works, almost shockingly well, because so little else has changed there's a sense of the uncanny, a subtext of indecision surrounds the whole design. 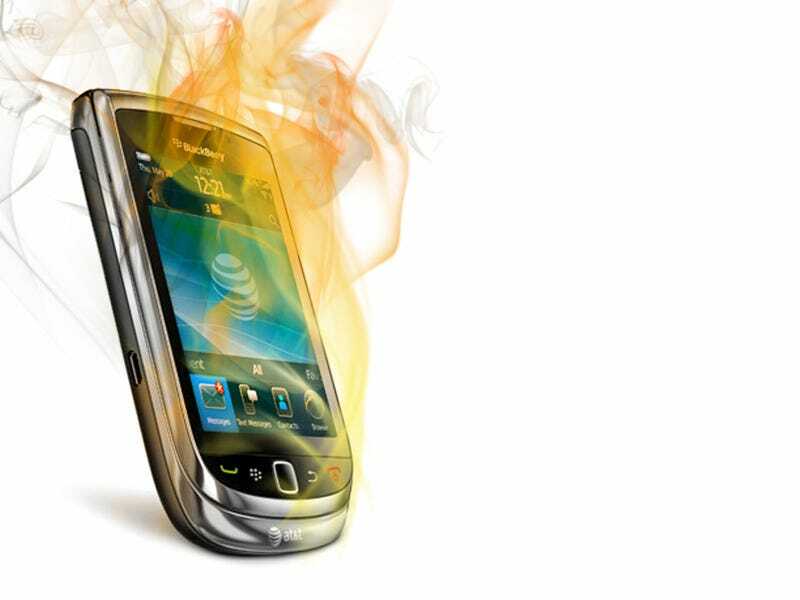 The Torch is as well-built as you could realistically want a phone to feel. The sliding action is smooth, perfectly balanced in the amount of effort it requires to shoot the screen up over the keyboard. It takes a push, and then it zips along the track until it clacks, satisfyingly. And it feels like you can do it 10,000,000 times. The rippled back is the right amount of rubbery, not so much it makes you hands feel weird, but textured enough the phone will never slip from even gross, clammy hands. The only issue is that the lock button on the left corner of the phone is too easy to trigger, so I pulled the phone out of my jeans pocket, an email half-filled out with jibber jabber or random phone number partially dialed, more often than I would've liked to. The keyboard, ripped from the Bold 9700 is stereotypically fantastic, clicky and ergonomic. It is still one of the best keyboards on any phone out there. The optical trackpad is a suitable trackball replacement, but most of the time, I simply wondered why it was there, since there's a much bigger surface to manipulate—the 3.2-inch screen—right above it. After nearly a year of staring at screens packed with pixel counts of at least 800x480, the Torch's low-res 480x360 display is a grisly sight. It's like going back to standard definition after a year of HD, and then having a wet fabric softener sheet shoved in between my eyeballs and the screen. Text looks ugly and jaggy compared to the Droid or iPhone. Websites are grosser. Pictures less detailed. It's almost a cruel joke AT&T's playing on RIM, knowing it'll be on pedestals mere feet away from the vastly better screens of the iPhone 4 and the Samsung Captivate. It's unbelievable that anybody's flagship phone in 2010 has a display this low rent. Even if you were absolutely determined to buy a new BlackBerry phone, you should wait for one with a better screen. Like the display, the Torch's brains are straight out of 2008. It quickly becomes apparent that the 624MHz processor is too slow. It often hangs and stutters moving from app to app—say from messages to Twitter to Facebook and back to the home screen—pinch-zooming in the browser, or sometimes even moving from app drawer to app drawer on the home screen (the latter less frequently, but it definitely happens). That's even with 512MB of RAM, the same amount as the iPhone 4, Nexus One and other modern phones. Even if you found the performance acceptable (which, if you've spent time with an iPhone 4 or Android 2.2 phone, you won't after about 10 minutes), it means that there's not a lot of headroom for more advanced capabilities down the road: The guts seem like they're being pushed to their max already. The Torch's battery life is up to BlackBerry par, which is to say, thoroughly excellent. I'm talking a day and half of moderate usage, and a day of heavy plowing, without a recharge (granted, I didn't use GPS very often because I didn't like AT&T's map application). Calls are loud and clear, though I noticed a subtle, high-pitched reverb—not quite an echo—in the earpiece whenever I talked, on multiple phone calls. Reception wasn't noticeably bad, but coming out of the subway more than once it took a few minutes to switch from EDGE back to 3G, and people more invested in the signal bar display might be nervous that it's apparently quite sensitive—even as I'm typing, it's bouncing between 4 and 5 bars like an ADHD child who's just been handed a giant box of Nerds. But no serious complaints. If the Torch's dual nature hinted at BlackBerry's psychological discord, BlackBerry OS 6 crystalizes it in a melange of glossy plastic, blue gradients, smoky shading, dull grays and white screencapes. It's largely a mess. Like Android, BlackBerry OS 6 will ostensibly support phones with and without touchscreens, which means that unlike iOS, Windows Phone 7 or webOS, it's doomed from the outset to a lack of clarity. RIM has more or less embraced that fact, so proliferation, a scattershot explosion of choices, seems to be the operating principle. Sure, there are a million ways to accomplish any one task, but it means there's no obvious right way to do it either. It's conceptually slippery. Examples! The front end of the interface is glossy, stylized, and not un-pretty. Dive into an options menu and it's like being hurled back into Palm OS circa 2005. It's highly incongruous. Or, more fundamentally, the way BlackBerry OS 6 integrates social networking, as most modern phones are wont to do. As you might've seen, it does this in a couple of ways. There's a social feeds app that, as you might expect, pulls in feeds from Twitter, Facebook, BBM, RSS and more, creating a single stream, so you don't have to dive into individual apps. The official Twitter and Facebook apps are baked into the OS as well, and they plug into the central notifications system and universal inbox. So, when there are new items in your Twitter or Facebook stream, you'll get a message in the universal "messages" inbox (which collects emails, texts, etc.) that you have new feed items waiting; there's the social feeds app; and there's the individual apps for Facebook and Twitter. If you have actual Facebook or Twitter messages, like a DM, they'll show up in the universal inbox and in the main notifications display on top of the homescreen. The only way to clear the messages count is to dive into the actual apps and read them—the social feeds app won't work for this. Like I said, it's messy, and at least initially, confusing, even though the idea of a single stream or inbox sounds fantastic. It's the implementation that fails. The homescreen feels conceptually muddled too. Rather than going for a full desktop with definable shortcuts and widgets all over the screen, like Android, it blends a drawer system with a half-desktop metaphor in a way that's less than natural. A handful of icons are visible, which can be dragged up, like a drawer opening skyward, to reveal more icons—apps or now, contacts—hidden below. When the drawer isn't "open," most of the screen is wasted space, just an expanse of wallpaper between the four visible icons and the status bar above. Flicking left or right takes you to a different "drawer" (or "panel," in Android parlance). Each one is a section, like frequent apps, media apps, or downloaded apps. Oh, one interesting point is the pause RIM has inserted into sliding between drawers. It registers your flick, takes a second, and then moves to the next drawer. It's an odd behavior, but so consistent it has to be deliberate. At the top is one of the more useful aspects of the homescreen, a notifications window like Android's—touching it drops down a list of messages and events from email or Twitter or whatever. Universal search is awesome, and very much what it should be. If there's one thing done truly well, interface-wise it's universal search. Start typing for a contact, an app, a song, an email, whatever—it'll pull it up, or offer to search the web, YouTube, App World and others. You can basically bypass the rest of the interface for getting to something, at least a good portion of the time. The touch keyboard is passable, but I don't think you'll ever use it over the real one. Otherwise, why did you buy this thing? Email also uses WebKit for HTML rendering now, and while the perks of BlackBerry are still there—hello, push Gmail—there are subtle annoyances, particularly when it comes to Gmail. For instance, a threaded conversation doesn't show the sender of the email, simply the number of items and the subject. Moreover, for most people, the split between the phone's inbox and the server's—which doesn't exist with standard IMAP implementations, or a Gmail app—feels awkward. The app itself is conservative, aesthetically. There's a way to make email beautiful and functional; Windows Phone 7's proven it. The allure of BBM as the be-all, end-all of mobile instant messaging is slightly diminished as well, given that Google Talk for Android accomplishes most of what I'd want it to do, and crosses the boundaries between phone and desktop. The distillation of this grand mishmash of observations and scenarios is this: BlackBerry isn't good enough anymore if you're comparing it to other smartphones. What does it do better than the rest? That's the fundamental question. And the answer is that for most people, in most situations, compared to Android and iPhone, not a whole lot. People who love BlackBerry exactly the way it is will like the Torch and BlackBerry 6, because it's pretty much the same. It offers a lot of marginal improvements in a lot of places—like the browser—even if it makes a mess of some things. That said, in a few months, they might like it a lot less. Nielsen numbers show that half of BlackBerry users are thinking about switching. This won't change their mind. And even with all of those corporate accounts locked down tight, it's hard to say that's not a problem. Maybe RIM's too big, too entrenched to build the kind of phone that'll make people want a BlackBerry again. But they could've at least given the damn thing a better screen.